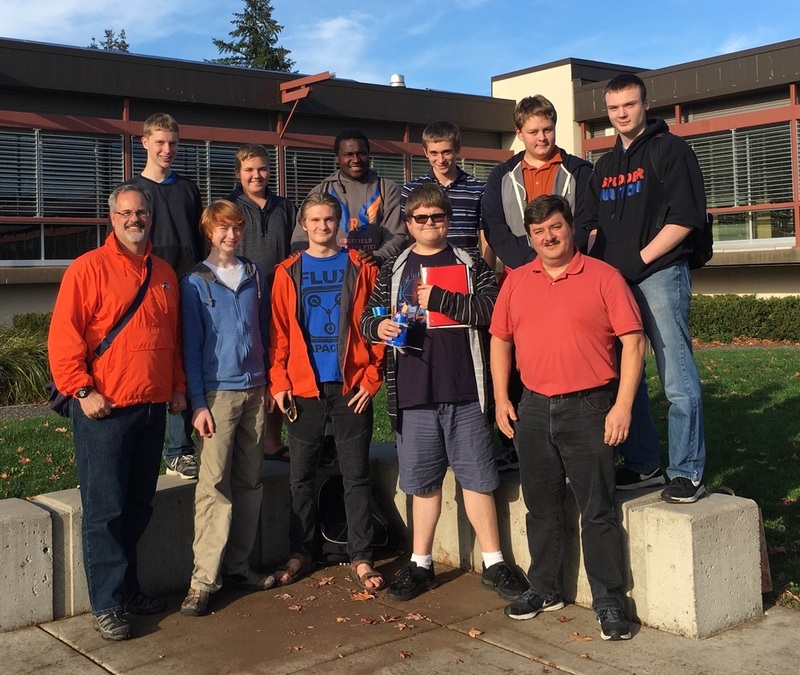 On Saturday, October 22, nine members of Ridgefield High School’s newly-created robotics team traveled to Gladstone High School to learn more about a new and most exciting venture—preparing for their first robotics competition. They were accompanied Physical Science teacher, Jeff Brink, who also mentors the team. The weekend event, FIRST Fare, is the first step for participants entering the FIRST Robotics Competition. FIRST (For Inspiration and Recognition of Science and Technology) was started in 1989 to inspire young people’s interest and participation in science and technology. The not-for-profit organization, based in Manchester, New Hampshire, designs accessible, innovative programs that motivate young people to pursue education and career opportunities in the STEM pathways (science, technology, engineering and math), while building self-confidence, knowledge and life skills. The competition challenges high school students and their adult mentors to work together on a common real-life engineering problem—to design and build a robot using a standard “kit of parts.” Following a set of common rules, they are required to complete the project in six weeks. The project culminates in a sophisticated field game using the robots, designed to bring out the best in every participant. FIRST redefines “winning” by rewarding teams for multiple achievements including excellence in design, demonstrated team spirit, a professional attitude and the ability to overcome obstacles. The quality of the overall experience (vs. winning) is what matters most. Saturday’s FIRST Fare event, presented by the Oregon Robotics Tournament and Outreach Program (ORTOP), provided training on robot-building and covered topics such as drive systems, Java programming, CAD design, web design, mechanical systems and electrical debugging techniques. Attendees also learned about Gracious Professionalism, a FIRST principle that encourages competition and high-quality work blended with respect and sensitivity among all competitors. A panel of engineers from Boeing, Daimler Trucks, Autodesk and Mentor Graphics were on hand at the end of the event to field questions from the students. Questions ranged from college opportunities to engineering and management skills. The build season for the FIRST Robotics Competition starts January 7 and concludes on February 21. The competitive season occurs March - April, during which the RHS team will compete in two events within FIRST’s Pacific Northwest District—one in Wilsonville (March 9-11) and the other in Lake Oswego (March 30-April 1). A District ranking in the top 64 teams (out of 170 total in Oregon and Washington) will qualify the team for the district championship in Cheney, Washington in early April. The top 41 teams from that competition advance to “Worlds”, which will be held later in April in Houston, Texas. “We are looking for more professionals to help mentor our team—mechanical engineers, programmers, web designers and business professionals and more partners to sponsor us,” said Brink. The team is also mentored by Chris Shipp, Metals/Wood Shop teacher at Ridgefield High School, Jason Marr, mechanical engineer for Boeing, and Chad Stryker, electrical engineer for Tektronix. Current sponsors include Boeing, Daimler, and the Society of Professional Engineering Employees in Aerospace (SPEEA). If you are interested in mentoring or sponsoring Ridgefield High School’s Steel Ridge Robotic Team, please contact Jeff Brink at 360-619-1320 or jeff.brink@ridgefieldsd.org.